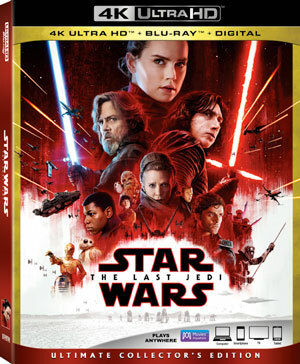 Walt Disney Home Entertainment and Lucasfilm have announced the upcoming release of Star Wars: The Last Jedi, scheduling 4K UHD, Blu-Ray Disc and DVD versions for release in late March. The visually stunning film welcomes the return of original characters, including Luke Skywalker, Princess Leia, Chewbacca, Yoda, R2-D2 and C-3PO and further explores the deepening journey of the saga’s new members, Rey, Finn, Poe, and Kylo Ren. Star Wars: The Last Jedi will be in stores on March 27.